Be sure to check out the official trailer, featuring a sampling of this year’s 51 films! Be sure to check out their great line-up: a warmup for our festival which starts on the 18th! We particularly recommend the International Rights Shorts Program that will be screening on Monday October 13 at 5pm at the Northwest Film Forum. Description: Although LGBT people enjoy more legal protections in some parts of the world, in others they are not so lucky. This collection of shorts shows some of the courageous struggles being fought. Compelling visions. Pathbreaking films. Stories to change the world. Those are the themes of the 2014 Social Justice Film Festival, once again taking place in Seattle in October. A notable feature this year: More than 40% of the festival’s official selections, including a U.S. premiere, have women directors, several from the Seattle area. • Oil and Water – Francine Strickwerda and Laurel Spellman Smith explore the fortitude of two boys who seek to counteract one of the world’s worst toxic disasters (Sat., Oct. 25, 7 pm, Northwest Film Forum). • One Generation’s Time – Shannon Gee looks at the lives of two murdered Filipino-Americans who played key roles in the Seattle labor movement (Wed., Oct. 22, 7:30 pm, UW Ethnic Cultural Center Theater). • Unified Struggle – Christy X explores deportation under the Obama administration, channeling the voices of those who are deemed un-American because of corrupt U.S. policies (Sun, Oct. 26, 3 pm, Northwest Film Forum). • A Dose for Dominic – Ruth Gregory examines the lives of two struggling parents raising their severely autistic child, and the decision to treat their child’s autism with cannabis (Sun., Oct. 26, 3 pm, Northwest Film Forum). • Maikaru – Amanda Harryman depicts a man whose mother was kidnapped and forced into prostiution at the age of twelve. Trapped in a world of drugs, human trafficking, and violence, Maikaru shines through the darkness (Sun., Oct. 19, 6 pm, Northwest Film Forum). • Return of the River – Co-director Jessica Plumb of the Olympic peninsula deftly shows the tenacity of Washingtonians striving to restore an ecosystem by persuading a community to take down a dam (Tue., Oct. 21, 7 pm, UW Ethnic Cultural Theater). • Invitation to Dance – At our festival kickoff party, Simi Linton, a disability rights advocate, proves that you don’t have to march to be politically engaged. All she asks is justice, equality, and a place on the dance floor (Sun., Oct. 19, 6 pm, NW Film Forum). • Natural Life – In an experimental film,Tirtza Even challenges the U.S. criminal justice system for sending five young individuals to prison for the rest of their lives (Mon., Oct. 27, 6:30 pm, UW William Gates Hall #138). • On the Side of the Road – The U.S. premiere of this film by Israeli former settler Lia Tarachansky brings an unflinching look at the origin of Israel and the destruction of 500 Palestinian villages (Thu., Oct. 30, 6:30 pm, UW Ethnic Cultural Center Theatre). Join us at the Social Justice Film Festival (October 18 – October 30) to appreciate our talented filmmakers, women and men, and a slate of extraordinary films. Check out a full list of feature films here, the film’s three special events here, and the schedule here. Tickets for the Kickoff Party with Invitation to Dance and the Special Evening on Immigration with Jose Antonio Vargas are anticipated to go quickly, so be sure to purchase in advance. Tickets are now on sale: get them while they last at Stranger Tickets. Early-bird all-festival passes are now available for the discounted rate of $40 ($50 after October 14). Read more about passes here or buy one now. The 2014 Social Justice Film Festival has completed review of more than 400 submissions and has made an official selection of more than 50 films. The official program is available now! The festival will run from October 18-30. We have several sizes of 100% organic cotton Social Justice Film Festival T-shirts available for $15 each! 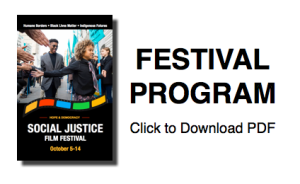 To order or pick up, please contact us at anne@socialjusticefilmfestival.org. Check out the full line-up of films here. With the election of Kshama Sawant to Seattle City Council and the ongoing political battle for a $15 minimum wage, the future of workers’ rights is a conversation gripping Seattleites of all backgrounds this spring. 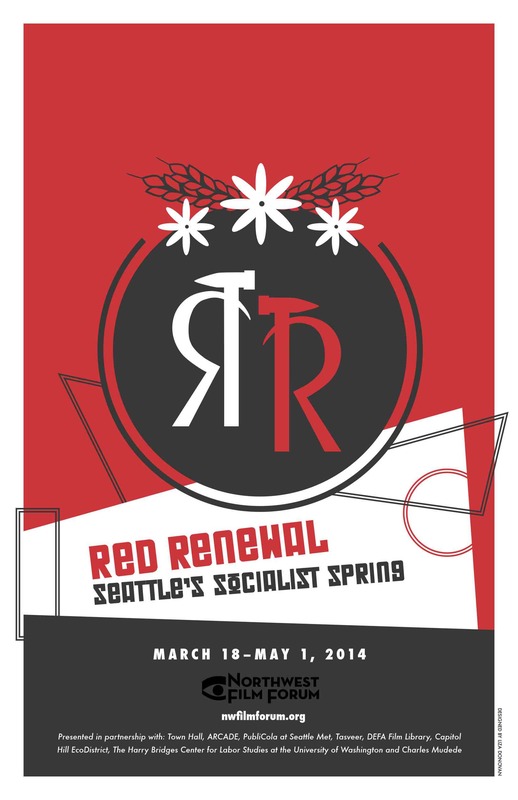 Red Renewal brings together community groups from across the city for collective contemplation of new and old films that resonate with ongoing conversations about Seattle’s economy and politics. Expect workers’ songs and digging in Seattle’s audiovisual archives, Soviet crocodiles and Slovenian psychoanalysts, radical labors of love, virtual public spheres and difference of opinions. 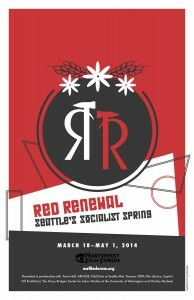 It all begins with a screening and discussion with Kshama Sawant and Charles Mudede at Town Hall on March 18. Check out the schedule of films here. This weekend, Real Change, a 2013 festival sponsor, is screening one of our 2013 films, Shift Change, as part o f its Economic Justice Film Series! 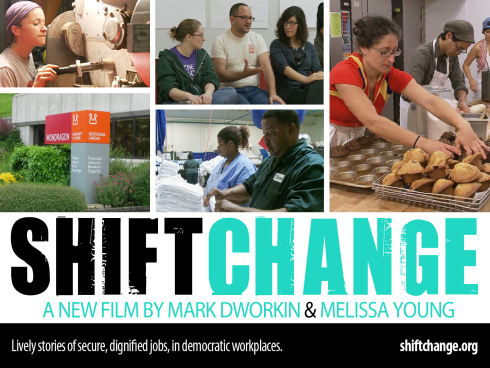 Shift Change is an inspiring film that features “lively stories of secure, dignified jobs, in a democratic workplace.” The film provides a refreshingly positive perspective on solutions to the economic crisis that can simultaneously increase worker conditions and participation. (Doors open at 11:30 am. Reserve tickets for priority seating). Reserve FREE tickets at www.realchangenews.org. 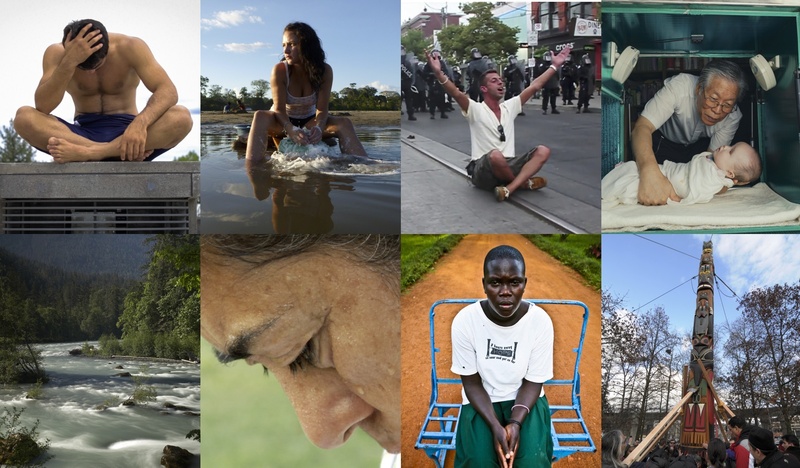 The Social Justice Film Festival is excited to announce the 2014 Call for Entries! We are now accepting submissions of short and feature-length documentary and narrative films that address issues of social justice. Submit by May 1 to receive discounted early bird prices! The late deadline is July 1. Read more details here and submit your film!